How often have you found yourself short on time? As a busy mother of two young children, it happens to me quite often. I keep dry shampoo on hand for those morning that just don't seem to go right. It leaves my hair feeling fresh and I can go about my day without feeling "dirty!" Giving me a little extra time to get things done. Batiste Dry Shampoo leaves your hair feeling clean and refreshed without leaving any residue. It's also so quick and easy to use. Simply spray it on, massage it in, wait a few minutes then brush and style. I usually spray it on my hair and then finish getting dressed. By the time I'm dressed, my hair is clean, fresh and ready to be styled as usual. 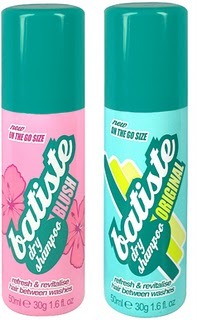 Batiste Dry Shampoo has a light scent that is both pleasant and refreshing. Batiste takes dry shampoo to a whole new level. They have a dry shampoo that will fit everyone's personality and/or hair color. They also come in on-the-go sizes that are perfect for travel, in your purse or to keep in the car for those last minute hair fixes! I also keep a can in our camper! Batiste Dry Shampoo banishes oily roots, giving dull, lifeless hair the makeover it needs without any water. A burst of Batiste not only refreshes hair, but leaves it full of body and texture too. So whatever last minute plans come up, you can grab life by the hair. 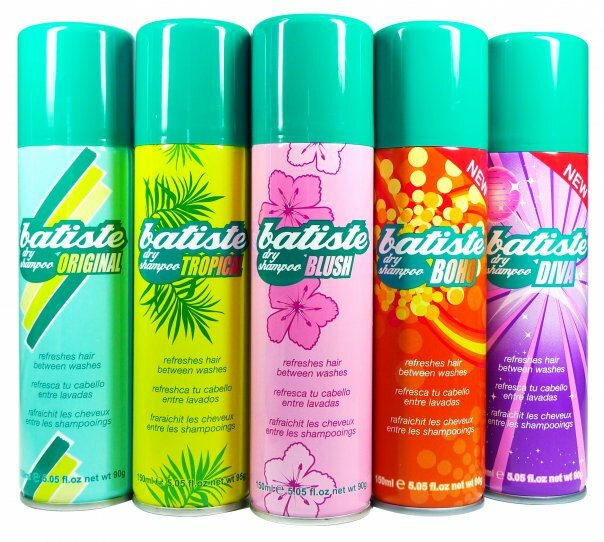 Visit Batiste and tell me which dry shampoo you would most like to try. This giveaway is open to US residents only. The winner will be chosen using Random.org, with the winner will be notified by e-mail. Please make sure I have a way to contact you. You can leave your email, or link to your blog site. The winner will have 48 hours to respond, if there is no response another winner will be chosen. **I received one or more of the products mentioned above for free. Regardless, I only recommend products or services I use personally and believe will be good for my readers. The views and opinions expressed on this blog are purely my own. Results may vary. I was not compensated in any other way for this review. The generous sponsor of this giveaway will mail the prize directly to the winner. A special thanks to Batiste Hair for this great review and giveaway opportunity! I think the new colored ones look neat! I've never used dry shampoo and I'd love to try it. I would love to try the new colored one in Medium. It sounds interesting. Sorry for deleting the other reply.I didn't give you my name. I added you button on my blog but geez it took a little bit of thinking.I should've just asked you.I'm silly like that. 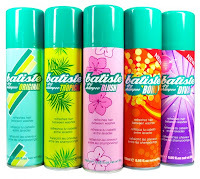 I would like to try the tropical scent- I have always wanted to try dry shampoo- hope I win! I would like to try Original.